Want to quickly see how the open-source software CompactCMS works? You'll find a free and updated demo installation of CompactCMS here. We are currently updating the CompactCMS demo. Please check back shortly. There will be a new version up soon. 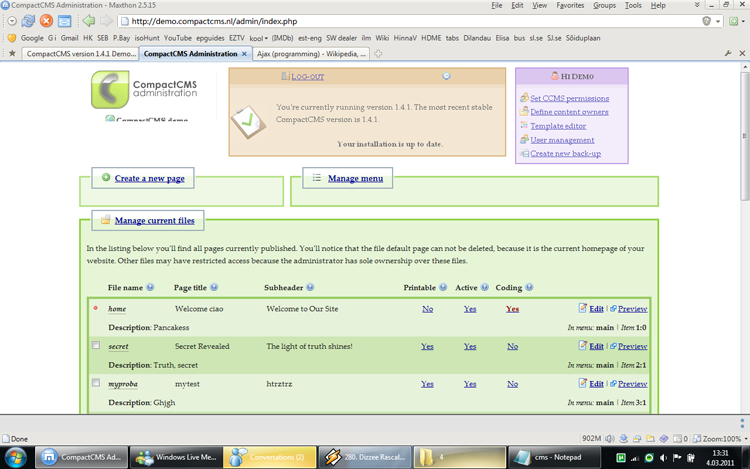 CompactCMS is a free open source light content management system released under the GNU General Public License v3. One of its key features is that it focused on providing an user friendly and clear interface for both administrators and users and making content management very easy. It comes with a WYSISYG editor, ability to resize images, advanced caching for improved performance and themes to customize the appearance of your demo site. The screenshots below will give you a preview of how a CompactCMS demo looks like and what kind of features the admin dashboard has to offer. The latest version available for download is 1.4.2 and was released on November 9, 2010. CompactCMS is no longer being developer or maintained.